2pm – Colonies checked for damage & weather quick check for amount of stores in colonies. If required colonies fed with bee fondant or with dry sugar. Equipment maintenance. 2pm – Colonies checked for damage & weather quick check for amount of stores in colonies. If required colonies fed with bee fondant or with dry sugar. Equipment maintenance. 9am Introduction to Beekeeping Course, parts 1-4. 2:30pm 3rd Winter Lecture: Dr Seirian Sumner – Wasps – why nobody loves them ? 4:00pm 4th Winter Lecture: Dr Nick Isaac – State of Pollinators and other wildlife in the UK. 2pm – Unless done two weeks previously, colonies checked for stores. In poor weather old frames cleaned, then fitting them with new foundation. 2pm – Colonies checked for stores, health, viability, a note taken if stocks need equalizing. In poor weather making up new frames and fitting them with foundation sheets. Colonies in nucleus hives transferred into full hives. 9am Introduction to Beekeeping Course, parts 5-8. 2pm – Weather permitting, routine inspections commenced; 2nd brood box or 1st super put on, but only if the season progressed well thus far. Suitable colonies for the queen and drone rearing selected. 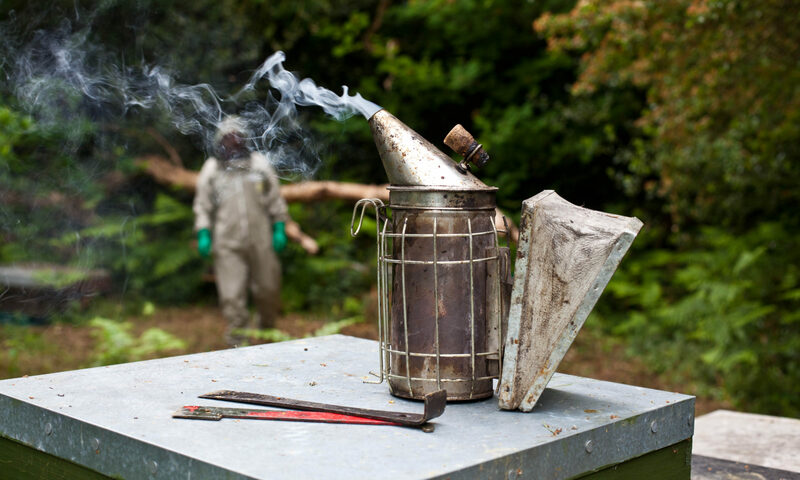 1pm – 3pm Basic Beekeeping Course: 2nd Practical – Swarm prevention. 3pm – Routine inspection of colonies, swarm prevention measures undertaken. Supers added to the colonies if needed. 2nd best colony prepared for raising drones for the queen rearing programme and fed with proteins rich pollen substitutes. 2pm Routine inspection of colonies, swarm prevention measures undertaken. Supers added to the colonies if needed. 2nd best colony prepared for raising drones for the queen rearing programme and fed with proteins rich pollen substitutes..
2pm Routine inspection of colonies, swarm prevention measures. Supers added to the colonies if needed. Varroa entrapment frames check. Old frames rendered down. 9:00am – 12:00 Basic Beekeeping Course: 3rd Practical – Dealing with difficult colonies. Uniting of colonies and re-queening. 1pm – 3pm Basic Beekeeping Course: 4th Practical – Making up frames, feeding, etc., if time allows, practical demonstration how to assemble a brood box (National). Conclusion. 2pm Routine inspection of colonies, swarm prevention, Varroa entrapment frames check. Old frames rendered down. 2pm – Routine inspection of colonies, swarm prevention, Varroa entrapment frames check. A colony selected for the queen rearing programme prepared. 2pm – Routine inspection of colonies, swarm prevention, Varroa entrapment frames check. 1pm – 2pm Queen rearing course Part 2: Check on grafting success. Preparation of the mating nucs. Time: TBA – Queen rearing course Part 3: Distribution of ripe queen cells into mating nucs. 1pm – 2pm Queen rearing course Part 4: Check on virgin queens emergence from queen cells. 2pm – Routine inspection of colonies, swarm prevention, Varroa entrapment frames check. Supers added. 1pm – 2pm Queen rearing course Part 5: Check if the new queens are starting to lay. 2pm – Routine inspection of colonies, swarm prevention, Varroa entrapment frames check. Due to cold weather and June gap, colonies fed if required. 1pm – 2pm Queen rearing course Part 6: Final session, marking and clipping the new queens. Conclusion. 2pm – Routine inspection of colonies, swarm prevention, last Varroa entrapment frames check.